« Europeans Wonder: How Can Minimum-Wage Workers in America Side with the Republican Party? What Americans are first taught about the world as children. This looks like a 1970-2005 point-of-view. These maps represent what Americans are first taught about the world as children. For a majority of Americans (speaking as an American now overseas) these maps are maps about feelings, rather than about knowledge. It’s true that there are some Americans who never progress beyond this viewpoint, but the majority of American adults are not quite this uneducated. Among those who are, it comes from the “We’re number one!” mentality that pervades what children are taught about America (or at least were until recently). This view of the world looks more like how Americans felt in the 1950s and 1960s. No matter how knowledgeable we become, it’s true that we can look at maps like this and understand the reasons they are drawn that way immediately–from our first knowledge as children. That’s what makes them cartoons, that some of those feelings stay with us forever, in spite of our knowledge. Anyone who lived through the Reagan years certainly remembers the country feeling just like this! This entry was posted on July 18, 2011 at 6:46 pm and is filed under Afghanistan, Africa, Algeria, American Culture, American Life, Anglo-Saxon Countries, Arab World, Argentina, Asia, Australia, Belize, Brazil, Britain, Business, Canada, Children, Chile, China, Colorado, Columbia, Ecuador, Education, Egypt, Elementary Education, Europe, Expat, Explaining American Culture to Foreigners, France, Germany, India, Intercultural, International, Israel, Italy, Japan, Lebanon, Libya, Lifestyle, Living Abroad, Malaysia, Middle East, Multicultural, New Zealand, North Africa, North African Culture, Norway, Pakistan, Palestine, Parenting, Peru, Relationships, Russia, Saudi Arabia, Singapore, South Africa, Spain, Sri Lanka, Sweden, Syria, Teaching, Tunisia, Uncategorized, Venezuela, War on Terror, World Economic Conditions, Yemen. You can follow any responses to this entry through the RSS 2.0 feed. You can leave a response, or trackback from your own site. Well — not exactly. My memories, I guess, are much different and more realistic; but, then, I collected stamps. It’s funny because it’s basically true. I would amend the top map to have Canada read something like “Home of the Mounties, hockey, and people who talk funny” and Europe to “rich kids go skiing and spend their summers here” based on my experience growing up. Lynne: The maps made me laugh though I have been out of the country too long to know if people are really that ignorant now. I hope not. 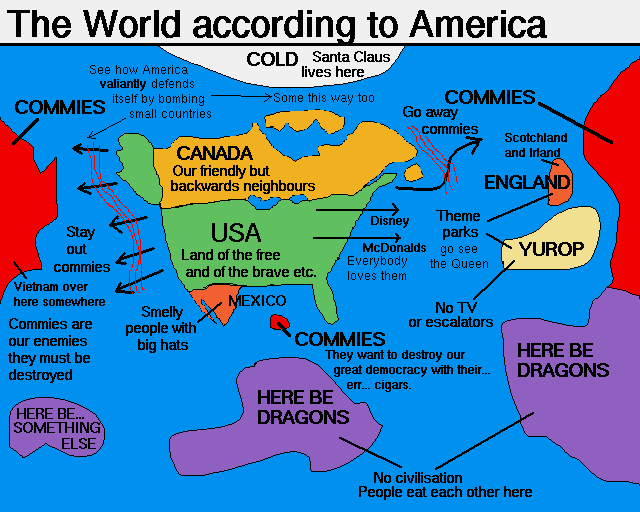 I remembered another map with Reagan’s view of the world but yours has most of the good things. For generations Americans have been taught, mostly by each other, that they are the best. Unlike dictatorships, where propaganda comes from above, in America it comes from neighbors and friends and comes spontaneously. I was surprised once when I was home to see that even cartoons are full of it. It is very hard to make American visitors here in Europe look beyond or through their deep conviction of superiority (except, a little, when it comes to France). 100swallows, I agree with you about everything! Thanks for taking the time to comment. I was certainly raised to think we are the best country in the world. I now know better after travelling extensively. American knowledge of geography is very poor. 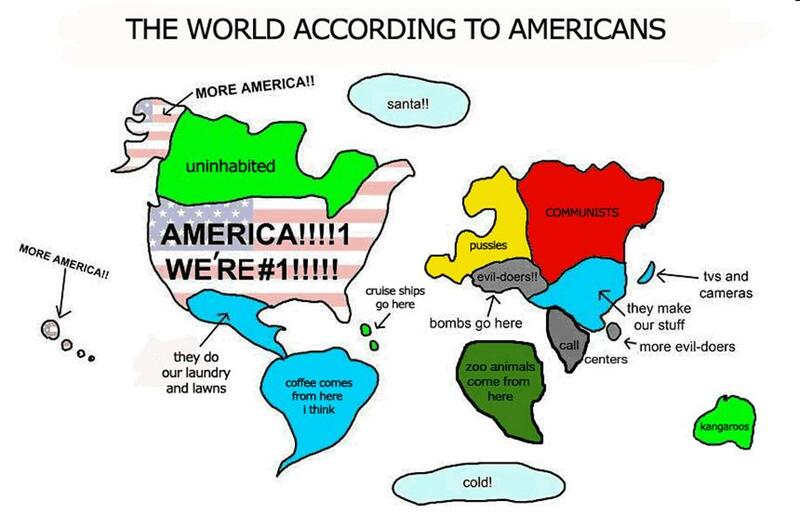 but yes, America could stand to brush up on geography. Very clever! Thanks for sharing it. It’s very clever, Luke. Thanks for the humorous link. Dumb! America is awesome, and I know where all the countries are, their names and their flags. Some people don’t know much about America. I don’t care for the Brits who are unattractive and drink tea, leave us alone. FYI brits ARE NOT unnatractive if u wanna throw stereotypes around Americans are either obese or annorexic! and half of us h8 tea! it isn’t fair to say the things u sed as much as it isn’t fair what i sed.Americans are mostly orriginated from england. i agree it isn’t fair to call it “dumb americans” but you don’t have to be as bad as them! Yeah, Zach isn’t the brightest bulb in the shed, there’s obviously a lot more to intelligence than geography or ancestry, but FYI most white Americans have German ancestry and there are more Irish Americans than Irish nationals and likewise with the Norwegians. So because I’m American, I assume a lot of other countries have a lot of diversity just like us. The reason I want to comment is that I think many foreigners get their understanding of America from the liberal Hollywood culture (movies, TV shows and such). Hollywood is very biased politically and leftist in their views. For instance, Hollywood constantly depicts Southerners as close-minded racists and bigots, Texans as cowboys and such. We know that TV is not reality or representative of reality, yet many foreigners grow up with these same stereotypes that Hollywood promotes to us here in the US. I only go to McDonalds once in a while with the kids as a treat when I dont want to make dinner, but foreigners think ALL families live on this junk. They think that all of us are rich (and we are by most standards), but wealth is relative to the culture a person lives in. When I was a child my mother would say, “Thank the Lord for supper”. Then she would scold me if I did not each my vegetables with, “There are many children in the world who do not get food like this everyday”. Yet, we were considered very poor. We did not have a telephone or other American luxuries. We had to eat meals at home and never went out to eat at restaurants. Many foreigners don’t understand the deep cultural roots of religion in the United States. Most of the English European colonists were very religious people and many (almost half of the founders of the country went to seminary and mention God in their writings). We have a very deep religious heritage based on the Christian religion. I was sent to church as a child and taught that Jesus loves me and died for my sins. I am amazed at the number of people who do not know God personally because, to me, his existence and love for me was a fact that I never questioned. I don’t understand why some people don’t love their creator. Why they think it strange that their are so many churches here in the US. If there were no churches in the US it would seem strange to me. I think that all people should love their country and their flag, and I think most people do. Is it not human nature to envy those who have more material wealth? This is why God says, “Thou shalt not covet” (or enviously desire what belongs to others). Yet, as a child growing up in the US, I desired to have the ice cream that other children got in school. I felt left out and hurt that my parents could not afford to give me the things that other children got, so I satin class and watched as the children ate their ice cream cones. Rich is more a matter of the heart and spirit, than of material things. We are only blessed because we belief in hard work. Hard work is what leads to financial wealth and a people deserve what they work for. I don’t understand why others feel it is the obligation of the United States to take care of other countries. It is not as if anyone in the world was there to give us what we have. Americans are fiercely independent people (except for the whining, ungrateful leeches who feel entitled to what others earn). We dont’ want the government to care for us, to the contrary, we want nothing more than the freedom and opportunity to earn out bread. And,yes, in America I am free to speech against my leaders, free to pray, free to defend my family from tyranny in government (the right to bear arms). This is my heritage, I am not ashamed, nor will I apologize. America is not perfect, but to me She is as good as it gets in this life. I cannot think of another country in the world that I would renounce my citizen to join. Yes, I love my country. I do not like our politicians (they are not of the calibre of men that founded this nation. But I love the fact that WE THE PEOPLE have the right to “alter and abolish it” and to “form a new form”-Thomas Jefferson. If we dont’ wake up and get rid of the overly powerful central government in Washington DC and encourage the biased media to stop its abuses of power and propaganda, then we will soon lose this once majestic, but now declining nation to derangement, moral depravity, complacency and apathy. Do not use God’s Name in vain (Third Commandment). Subordinating ‘God’ to your Nationalistic Pride and Personal Ego is a diabolic sin deservant of Hellfire. Has it occurred to you that you tying up Religion with nationalism is what puts most people off Religion. All people of the world are the same, and most work hard. God gives material wealth to people as a test to see if they remain grateful to him or become arrogant and attribute it to their own effort. You are a denier of the one true God, and try to subject Him to your whims, no-one is fooled apart from yourself. Those who follow God and obey all the ten Commandment and recognise he is Merciful and Compassionate and pray for his Mercy live the the areas of the World which you would happily bomb to serve the atheist Zionist agenda. The reason the USA isn’t loved is they exploit all the countries around them for their personal benefit (like all Empires before them) and no-one want America’s Help, except the stupid. Make Repentance and accept the Reality, the Truth that Jesus was an olive -skin aramaic (arabic) speaking Palestinian who submitted to God (i.e. a Muslim). BTW, another thing that foreigners think is that Americans don’t know alot about other countries and/or that we are dumb. Foreigners don’t understand the back ground for this in Americans. We are separated by a large ocean for one thing, but this is a very big country. I have never even been to the West coast (California, Arizona, etc. It would take me one week to drive there and it is very expensive to travel to the other side of the country), It is all I can do to keep up with what goes on in this country because it is so big (3000 miles across). There is so much to see here (mountains, deserts, oceans, vast prairies,and I have never seen even a 1/3 of it in my 45 years). Why travel to other countries when I have not even seen my own? Another factor is that our first President, George Washington, suggested that we stay isolated from Europe’s problems because entanglements would only lead to resentments in the end. Well, FDR ended that by becoming engaged in WW2. Sure enough, people resent us for getting involved in their affairs. The way I see it as an American is that other countries want our prosperity, but not our friendship. You can’t have someone give you something without strings attached. So my suggestion is that other countries deal with their own problems and that we bring our soldiers home and get out of the United Nations. We cannot and should not be the world police and take care of everybody. If people want our brand of democracy, then they can fight for it the way we did over 236 years ago. Sonia, I wanted to thank you, first of all, for reading my blog, and secondly, for the two very long and thoughtful comments you left. My French teacher in high school was from France (early 70s) and told us that when she had moved to America, that her French family was horrified, and thought that by coming to Colorado she was arriving in the middle of cowboys and Indians (what I suppose they knew of Colorado from films of that time). About ten years ago, some Dutch people I know went to visit New York City. They were absolutely convinced before going that Americans ate nothing but fast food and were concerned that they would not be able to find any decent or interesting restaurants. I’m happy to say that when they returned, they told me that it was completely different than they expected and that of course they found plenty of great restaurants. And yes, I was also taught in school (in the 1960s) that the founders of our country believed in isolationism and staying out of foreign wars. When I mention this to many people now, especially foreigners, they don’t believe me. So I’m really glad others out there remember this and were taught this, as well. Again, thank you for leaving two such wonderful and thoughtful comments. That guy that left the really long response is really rightist. If America didn’t get involved in places like the Middle East they would still bomb us. We need to prevent that. And even if they didn’t bomb us we need that oil. The fact of the matter is that if we ran out of oil in America this second we would be done. We need to protect our interests in other countires which is why we need to be involved worldwide. How did they get your oil in the first place? I think that America is an amzing country, and it isnt just them brought up with a view of the world that maybe isnt right. I grew up in England, and honestly thought of germany as evil. I grew up realising they werent, but I thought of Americans as obese idiots, not because I was taught it, but because I didnt know any better. Those maps sum it up, the comments defending them sum it up even worse. That’s all you ever hear about is how “We’re from America, we’re better than you!”. They can’t take any criticism when it’s point blank in their face. The maps are dead on accurate what you’re taught through indoctrination in school. I’ve met many foreigners that absolutely hate the people we breed over here for their sheer ignorance and willingly stupid defenses to war. The biggest problem with America is that the majority are TV fed and brainwashed by mainstream media. That’s why they come up with stereotypes for minorities and other countries. The best example I can give you is how everyone thinks Muslims are terrorists just because that’s all they show them as on television. I just wanted to tell you the maps were so good I had to use them in my own blog I wrote about Blind Patriotism. those map unfortunately refect some reality,,,about a month ago a man from USA asked me if Argentina was part of Portugal since we spoke portuguese. and i told him , I´m from america too” and he said ” impossible, if you live in Argentina, how can you be American?” He thinks only USA is America, her forgot Central America and South America it seems. That’s an interesting story, Celia! Of course we Americans don’t usually say we are from the “United States;” we normally say we are from “America” which we actually use as the name of our country in conversation. “In America (meaning the United States), we think this, or do this…” Thanks for commenting. Sadly most of this is true, a lot of Americans are ignorant and do not really care about the rest of the world. Unfortunately, proper and respectable Americans get pooled in with the ignorant, blood-thirsty, or corrupt Americans. I truly hope I get to travel to other countries, hopefully being able to further my knowledge of other cultures and traditions. The world is a rich place, and every country and every person has their flaws. Most Americans unfortunately do not realize that The United States is not #1 anymore. We lack in education, we lack in economics, and we lack in common decency. Everyone is so hopped up on reality tv and entertainment the things that are really important go by the wayside. These maps represent what Americans are first taught about the world as children. For a majority of Americans (speaking as an American now overseas) these maps are maps about feelings, rather than about knowledge. Reblogged this on Dreaming Destiny. No need to apologize for the post, it was insightful. Thank you for the post.